Let there be no doubt. The Hebrew University of Jerusalem was founded as a secular institution, and it remains such. Yet, rabbis were present at the opening ceremony on 1 April 1925 (7 Nisan 5685). In any event the first university in Mandate Palestine is an integral part of Israeli history. A visit to the original campus on Mount Scopus is quite interesting. The university occupies a large tract of land purchased in large part with monies raised by Chovevei Tziyon. The land, however, was not totally empty when it was acquired. In 1902 Sir John Gray Hill, a wealthy English lawyer, chose to build a house on a plot of land overlooking Jerusalem in one direction and the Dead Sea in the other. He had traveled to Palestine every year since 1887, and two years later he bought the land in question. The view was magnificent, but 13 years went by before Gray Hill and his wife decided to build. Lady Caroline Emily Gray Hill was an artist, and this was by all measures an ideal location for her studio. As one visitor later described the view from the house, it was a "vision of beauty." During the construction, however, something totally unexpected happened. The workers found a cave, and archeologists were called in. The area was excavated, and an important discovery was made --- ossuaries with bones and jewels. There was no question to whom the burial area belonged; written were the words, "Nicanor from Alexandria." As the Gemara (Yoma 38a) describes, Nicanor traveled from Alexandria to bring gates for the Second Temple. He loaded two bronze gates on a ship, but a large wave threatened the vessel. Nicanor cast one gate overboard into the sea but the sea continued to rage. Then, he declared that he should be thrown into the sea with the second gate. Suddenly, the sea became calm. By nothing less than a miracle, the first gate appeared when the ship arrived in Akko. Some said that a sea monster spit it out. Others claim that the bronze gate became attached to the underside of the ship. In any event, the Gates of Nicanor were installed on the western side of the Women's Section in the Second Temple. By the accounts of Josephus, the gates were truly impressive. Estimates are that they stood 40 cubits wide and 50 cubits high. In the case of this grave, no, do not start looking for the burial coffin in the closed-off cave. Archeologists carted it off to London in the early 20th century. In 1914 the Gray Hill house was sold to the builders of the Hebrew University, and the area was totally redeveloped. The grave of Nicanor, though, was not destroyed. 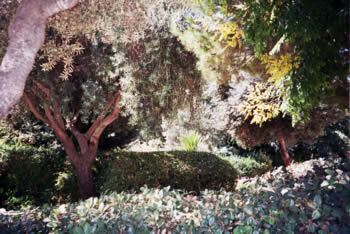 It became part of the botanical gardens, which contain the flora of Palestine. Over the years the academic program of the university grew. From three departments, each housed in a separate building, new subjects were added. More space was constructed. An amphitheatre was built for ceremonies. Even lions were brought to the university. Real ones! They were part of what became the Biblical Zoo. A secret. Not everything in the history of Hebrew University is honest! In the 1930s the university was a knowing accomplice of bogus academic certificates! The university had started as a graduate school, and only later were undergraduate studies added. Mandate officials were strictly enforcing immigration restrictions, even for Jews trying to flee Hitler's Germany. A loophole was education. So, Hebrew University knowingly recognized forged academic records to allow German Jews to enter. At 0945 on 13 April 1948 history stopped. A convoy of ten vehicles bound for the university and Hadassah Hospital was attacked in Sheikh Jarrah, opposite today's Kenyon School of Archeology. (A large monument marks the site.) Five vehicles escaped, but in the remaining five, 78 Jews were murdered. It was eminently clear that life on Mount Scopus had changed. 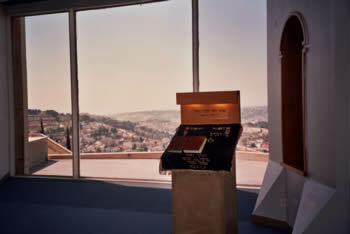 Under the armistice of 1949, the Hadassah-Hebrew University complex on Mount Scopus became an Israeli enclave, accessible by escorted convoy once every two weeks. The university moved to downtown Jerusalem, then to Givat Ram. Chanukah is a simple of Jewish resistance and the rejection of defeatism. From the early 1950s Israeli forces lit a large Chanukah menorah every night of the holiday. 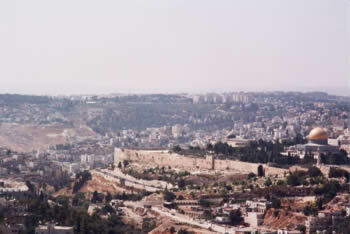 The flames could be seen in many parts of Arab and Jewish Jerusalem. After the area was recaptured in 1967, a large Chanukah menorah was placed atop the university's Hecht synagogue. The tradition continued. While Mt. Scopus was surrounded by Jordanian Jerusalem, caring for the botanical gardens was the last thing on anyone's mind. In 1967, after the Six Day War, what had been the enclave was in a shambles and had to be restored. As botanists toiled in the gardens, a new discovery was made again totally by accident. There was another burial cave next to that of Nicanor! Per inscriptions in Aramaic, the second cave contains the remains of Channiah Ben Yonatan, the Nazir, and his wife and family; they are interred in two sarcophaguses and 14 ossuaries. At least for this writer, seeing the grave emphasized that nazir is more than a technical concept in the Gemara. 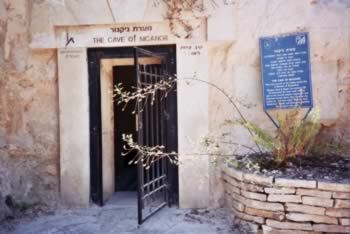 Entrance to the botanical gardens of Hebrew University and the area of the Nicanor and Nazir burial caves is gratis. If you are inclined to visit the botanical gardens, floral names are in both Hebrew and Latin. A major attraction at the university is the aforementioned Hecht synagogue, which is located in the Humanities Building. It provides what is nothing less than a fantastic panoramic view of the Old City and its surrounding area. As one looks out the window there is absolutely no question in which direction he should pray. A curiosity: Barbara Streisand, the noted American singer, donated part of the building for Jewish Studies. It seems that her father, whom she never knew (he passed away when she was an infant), was a religious Jew and a Torah scholar. This was her way of honoring him. The Nancy Reagan Square? It seems that her husband, then-Governor Ronald Reagan of California, helped raise funds for the university. When one thinks of a university, what often comes to mind is the esoteric and the theoretic. At Hebrew University many very practical items have also been produced. One development is the writing of a computerized catalogue system used by most major libraries in the world. One of its advantages is the ability to work in non-Latin languages such as Hebrew, Arabic, Russian, and even Japanese and Chinese. Another invention developed at Hebrew University is dripped water irrigation, in which thin pipes are directed by computer to provide plants with water and nutrients according to a pre-determined schedule. The system can even be programmed so that each individual plants is given its own "recipe" and quantity. One of the major benefits is the more efficient use of water. Israeli-owned factories produce these pipes in Israel, the United States and Australia. Hebrew University can be reached by busses 4A, 19, 26, 28, and 42. Tours are by prior arrangement with the Office of the Spokesman. Official identity is required for entrance.